Obsession Bloggers ‘with street style reached its peak here in Paris, and could have been in the mind of Karl Lagerfeld when erected fences of a typical Parisian street “boulevard Chanel”, inside the Grand Palais last week part of Paris Fashion Week. Show attendees had to look twice to realise it was fences and no real street brick and mortar (clearly no expense spared here from the House of Chanel, just think how many 2.55’s did they have to sell for that). They even had actual puddles on the sidewalk, as even a Chanel Street is not immune to occasional downpour. Models came out in droves, alone or in twos and threes chatting as if to take a casual stroll on Saturday. Their clothes felt like themselves, which might have something to do with the familiarity of them. Some said it was a heritage collection, exactly the kind of clothes that Chanel wealthy clients come to this house. There were countless interpretations of tweed suits each as unclassy as the following if they were provided in the flared pants or micro minis; showy flowers over silk painting, kicky pleated skirts-box, sometimes layered over tight black pants; and cocktail dresses mosaic compounds pewter rectangular plastic tablets, arranged like bricks, which were echoed back to the architecture of the environment in the series. Although a shabby collection of a brand with such history, I strongly noted several models wore glasses that unmistakably resembled those worn by American feminist, journalist and activist, Gloria Steinem in the 1970s, and their long, straight, unfussy hair styles recalled the era too. 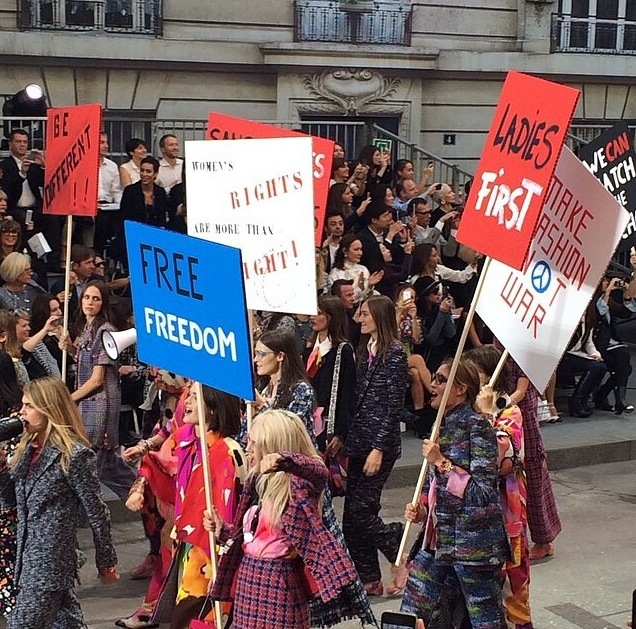 But lets be honest, I’m not sure if it was a thankfully welcome shift from Chanel’s Autumn Winter 2014 collection. That show was staged in an artificial supermarket, and the collection included hole-pocked pink leggings, velour jumpsuits, and oversized, soft-shouldered coats that didn’t exactly scream “power dressing.” Frankly, it was kind of ugly as if the house of the double C’s met with Juicy Couture. 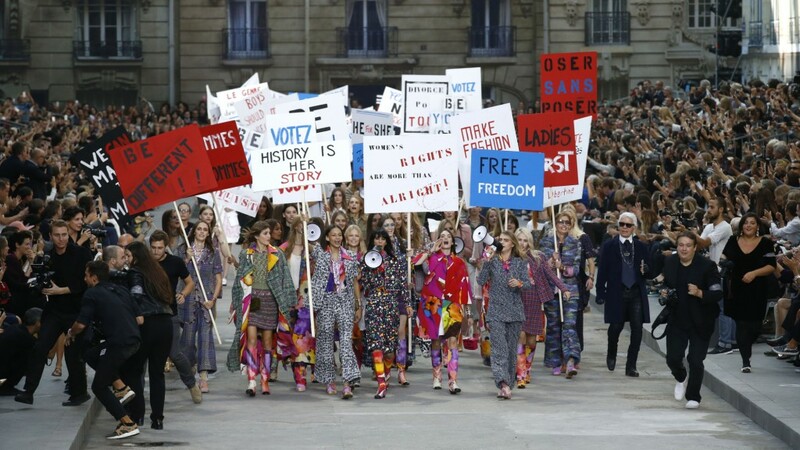 Do I believe Karl’s vision and spirit for the historic house of Chanel? No. Trying to to be controversial? Yes. I get the brand is built on history. “My mother was a feminist, and I was brought up with a history of that,” says Lagerfeld of his inspiration. However, I am left wondering: was this a true message of support for the recent feminist movements from the King of Fashion? Or, is this display of solidarity amongst our top models in fact just a publicity stunt for an industry that has been accused of being woman-hating for far too long? This entry was posted in Trend Reports and tagged chanel, fashion blog, pfw, spring 2015. Bookmark the permalink.